"learning and sharing to bee healthy with products from the beehive"
The aim of this work was to compare the effects of honey, sucrose and glucose on plasma glucose and C-peptide levels in children and adolescents with type 1 diabetes mellitus. 1. Honey has a lower glycemic and peak incremental indices compared to glucose and sucrose in both type 1 diabetic patients and non-diabetics. Therefore, we recommend using honey as a sugar substitute in type 1 diabetic patients. 2. In spite of its significantly lower glycemic and peak incremental indices, honey caused significant post-prandial rise of plasma C-peptide levels when compared to glucose and sucrose in non-diabetics; indicating that honey may have a direct stimulatory effect on the healthy beta cells of pancreas. On the other hand, C-peptide levels were not significantly elevated after honey ingestion when compared with either glucose or sucrose in type 1 diabetic patients. Whether or not ingestion of honey in larger doses or/and for an extended period of time would have a significant positive effect on the diseased beta cells, needs further studies. It is often hailed as a natural, healthy sweetener – but in most cases, honey bought from supermarkets today is simply sugar syrup with no nutritional value at all. To reap the true benefits of what was dubbed ‘the food of the gods’ by the Ancient Greeks, you have to look for the raw variety. Raw honey is particularly high in polyphenols, an antioxidant that has been linked to a reduced risk of cancer, lowering blood cholesterol and combating heart disease. The darkest varieties of honey include heather and hedgerow honey, which have a polyphenol content of 201mg per gram. In contrast, rapeseed oil honey, known in supermarkets as ‘blossom honey’, trails behind at just 71mg per gram. The University of Waikato in New Zealand found that when raw honey was applied to MRSA infected antibiotic-resistant wounds, they became sterile and healed so quickly that patients could leave hospital weeks earlier. Scarring was minimised because peeling back a dressing glazed in honey – as opposed to a dry bandage – did not disturb the new tissue underneath. If you suffer a minor wound or burn, glaze a bandage with raw honey and cover. Change the glazed bandage every 24 hours and any cuts or signs of infection should disappear within a week (if not, see a doctor). Raw honey’s anti-inflammatory properties can help soothe chronic skin conditions. Cleopatra famously bathed in milk and honey because of their skin-softening qualities – honey is a natural emollient as it is humectant (it attracts water). Melting half a jar of raw honey into a warm bath will promote healing in patients suffering with skin conditions such as psoriasis or eczema, too. Mixed with olive oil, raw honey applied to the scalp is also a great tonic for those suffering with a seborrheic dermatitis (a flaky scalp condition). Parkinson's disease (PD) is a progressive neurodegenerative disorder characterized by progressive selective loss of dopaminergic neurons in the substantia nigra. Recently, bee venom was reported to protect dopaminergic neurons in the 1-methyl-4-phenyl-1,2,3,6-tetrahydropyridine induced mice PD model, however, the underlying mechanism is not fully understood. The objective of the present study is to investigate the neuroprotective mechanism of bee venom against Parkinsonian toxin, 1-methyl-4-phenylpyridine (MPP(+)), in SH-SY5Y human neuroblastoma cells. Our results revealed that bee venom pretreatment (1-100ng/ml) increased the cell viability and decreased apoptosis assessed by DNA fragmentation and caspase-3 activity assays in MPP(+)-induced cytotoxicity in SH-SY5Y cells. Bee venom increased the anti-apoptotic Bcl-2 expression and decreased the pro-apoptotic Bax, cleaved PARP expressions. In addition, bee venom prevented the MPP(+)-induced suppression of Akt phosphorylation, and the neuroprotective effect of bee venom against MPP(+)-induced cytotoxicity was inhibited by a phosphatidylinositol 3-kinase (PI3K) inhibitor, LY294002. These results suggest that the anti-apoptotic effect of bee venom is mediated by the cell survival signaling, the PI3K/Akt pathway. These results provide new evidence for elucidating the mechanism of neuroprotection of bee venom against PD. The antibacterial activity of honey has been known since the 19th century. Recently, the potent activity of honey against antibiotic-resistant bacteria has further increased the interest for application of honey, but incomplete knowledge of the antibacterial activity is a major obstacle for clinical applicability. The high sugar concentration, hydrogen peroxide, and the low pH are well-known antibacterial factors in honey and more recently, methylglyoxal and the antimicrobial peptide bee defensin-1 were identified as important antibacterial compounds in honey. The antibacterial activity of honey is highly complex due to the involvement of multiple compounds and due to the large variation in the concentrations of these compounds among honeys. The current review will elaborate on the antibacterial compounds in honey. The antimicrobial activity of 19 propolis extracts prepared in different solvents (ethanol and propylene glycol) (EEP/PEP), was evaluated against some bacterial and fungal isolates using the agar-well diffusion method. It was verified that all the samples tested showed antimicrobial activity, although results varied considerably between samples. Results revealed that both types of propolis extracts showed highly sensitive antimicrobial action against Gram-positive bacteria and fungi at a concentration of 20% (Staphylococcus aureus, Streptococcus mutans, Candida albicans and Saccharomyces cerevisae) with a minimal inhibitory concentration (MIC) ranging from 0.5 to 1.5 mg/ml, with a moderate effect against Streptococcus pyogenes (MIC from 17 to 26 mg/ml). To our knowledge, this is the first study showing elevated antimicrobial activity against Gram-negative bacteria [Salmonella enterica (MIC from 0.6 to 1.4 mg/ml)] and lesser activity against Helicobacter pylori (MIC from 6 to 14 mg/ml), while Escherichia coli was resistant. 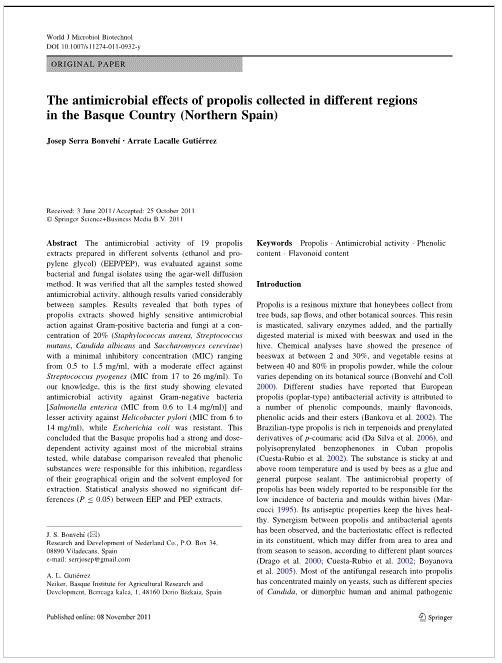 This concluded that the Basque propolis had a strong and dose-dependent activity against most of the microbial strains tested, while database comparison revealed that phenolic substances were responsible for this inhibition, regardless of their geographical origin and the solvent employed for extraction. Statistical analysis showed no significant differences between EEP and PEP extracts. The future of drug design lies in developing therapies that can target specific cellular processes without causing adverse reactions in other areas of the nervous system. Scientists at the Universities of Bristol and Liège in Belgium have discovered how to design drugs to target specific areas of the brain. The researchers have been using a natural toxin found in bee venom, called apamin, known for its ability to block different types of SK channel. SK channels enable a flow of potassium ions in and out of nerve cells that controls activity. The researchers have taken advantage of apamin being able to block one subtype of SK channel better than the others, to identify how three subtype SK channels [SK1-3] can be selectively blocked. Caffeic acid phenethyl ester (CAPE) is an active constituent of honeybee propolis inhibiting nuclear factor (NF)-κB. The aims of our study were to provide new data on the functional relevance and mechanisms underlying the role of CAPE in regulating inflammatory processes at the epithelial interface in the gut and to determine the structure/activity relationship of CAPE. CAPE significantly inhibited TNF-induced IP-10 expression in intestinal epithelial cells. Using various analogues, we demonstrated that substitution of catechol hydroxyl groups and addition of one extra hydroxyl group on ring B reversed the functional activity of CAPE to inhibit IP-10 production. The anti-inflammatory potential of CAPE was confirmed in ileal tissue explants and embryonic fibroblasts derived from TNF(ΔARE/+) mice. Interestingly, CAPE inhibited both TNF- and LPS-induced IP-10 production in a dose-dependent manner, independently of p38 MAPK, HO-1 and Nrf2 signaling pathways. We found that CAPE did not inhibit TNF-induced IκB phosphorylation/degradation or nuclear translocation of RelA/p65, but targeted downstream signaling events at the level of transcription factor recruitment to the gene promoter. This study reveals the structure-activity effects and anti-inflammatory potential of CAPE in the intestinal epithelium. Bacterial biofilms are associated with persistent infections due to their high resistance to antimicrobial agents. Hence, controlling pathogenic biofilm formation is important in bacteria-related diseases. 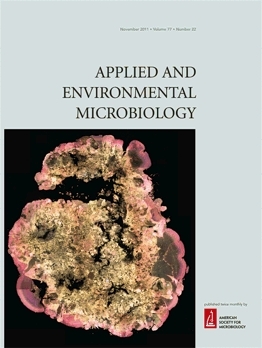 Honey, at a low concentration of 0.5% (v/v), significantly reduced biofilm formation in enterohemorrhagic Escherichia coli O157:H7 without inhibiting the growth of planktonic cells. Conversely, this concentration did not inhibit commensal E. coli K-12 biofilm formation. Transcriptome analyses showed that honey significantly repressed curli genes (csgBAC), quorum sensing genes (AI-2 importer and indole biosynthesis), and virulence genes (LEE genes). Glucose and fructose in the honeys were found to be key components in reducing biofilm formation by E. coli O157:H7 through the suppression of curli production and AI-2 import. Furthermore, honey, glucose and fructose decreased the colonization of E. coli O157:H7 cells on human HT-29 epithelial cells. These results suggest that low concentrations of honey, such as in honeyed water, can be a practical means for reducing the colonization and virulence of pathogenic E. coli O157:H7. Because of the tradition of using honey as an antimicrobial medicament, we investigated the effect of natural honey (NH) on Streptococcus mutans growth, viability and biofilm formation compared to an artificial honey (AH). AH contained the sugars at the concentrations reported for NH. NH and AH concentrations were obtained by serial dilution with tryptic soy broth (TSB). Several concentrations of NH and AH were tested for inhibition of bacterial growth, viability and biofilm formation after inoculation with S. mutans UA159 in 96-well microtiter plates to obtain absorbance and CFU values. Overall, NH supported significantly less bacterial growth compared to the AH at 25 and 12.5% concentrations. At 50 and 25% concentrations, both honey groups provided significantly less bacterial growth and biofilm formation compared to the TSB control. For bacterial viability, all honey concentrations were not significantly different from the TSB control except for 50% NH. NH was able to decrease the maximum velocity of S. mutans growth compared to AH. In summary, NH demonstrated more inhibition of bacterial growth, viability and biofilm compared to AH. This study highlights the potential antibacterial properties of NH, and could suggest that the antimicrobial mechanism of NH is not solely due to its high sugar content. Honey is an all natural humectant, keeping 'things' moist, like skin, hair, face, throat, even baked goods like cupcakes! The effectiveness of radiation therapy for oral cancer is often outweighed by an adverse effect mucositis, a painful inflammation and ulceration of the mucous membranes lining the mouth. Drawing on research indicating that honey may promote wound healing, three scientists at Manipal University in Mangalore, India, studied its anti-inflammatory properties to see whether it might prevent severe oral mucositis in patients receiving radiation therapy. Their single-blind, randomized, controlled clinical trial compared the effects of honey with those of Lignocaine, a local anaesthetic. Only one patient in the honey group developed intolerable oral mucositis. Because honey is readily available, affordable, and well accepted by patients, the investigators recommend its use in patients receiving radiation therapy for oral cancer. The healing properties of propolis -- a mixture of resin and wax made by honey bees to seal and sterilize their hives -- have been known for many years. But its use in medicine and food supplements has been limited because the sticky substance is not water soluble and has a strong, off-putting smell. Now researchers at the University of Bradford's Centre for Pharmaceutical Engineering Science have developed a way of purifying propolis that retains its medicinal properties, but makes it dissolve in water and eliminates its pungent smell. The technique has already led to the development of a new mouth ulcer gel and opens the door to a huge range of other pharmaceutical and nutraceutical applications for the substance. "Propolis is a complex chemical mix and a very useful natural product," explains Centre Director, Professor Anant Paradkar, who led the research. "Propolis has been shown to be anti-microbial, anti-fungal, a strong anti-oxidant, non-allergenic and can boost the immune system. It also promotes wound healing and has anaesthetic properties. "There is a substantial market for propolis-based products -- particularly in China, the USA and South Asia. The main stumbling block in developing products has been the solubility and odor issues, which our formulation overcomes." Professor Paradkar's team has been developing the new technique to purify propolis in collaboration with natural medicine manufacturer, Nature's Laboratory. The researchers have helped the company develop a new propolis-based mouth ulcer gel, which has better anaesthetic, anti-microbial and anti-fungal properties than gels already on the market and is safe for use in children. "A problem for mouth gels is that adhesion to the skin membrane inside the mouth is difficult -- because of the nature of the surface, the gel can simply slide off," says Professor Paradkar. "As propolis retains some of its stickiness even in a water soluble formulation, when it is applied to specific areas in the mouth, it adheres more effectively." The Centre has gained funding for a Knowledge Transfer Partnership with Nature's Laboratory, to further develop the purification system for use at a larger scale and support the creation of new propolis-based products. The aim is, through the KTP, that the company will be able to set up a purification process to increase its own manufacturing capacity. An alternative approach to antibiotics is the development of anti-pathogenic agents to control the bacterial virulome. Such anti-pathogenic agents could target a phenomena known as quorum sensing (QS). Six bacterial N-acyl-homoserine lactone (AHL)-dependent bioreporter strains were used to evaluate if bee hive glue also known as propolis contains constituents that capable of inhibiting QS-controlled AHL signaling. In addition, the effect of propolis on the QS-dependent swarming motility was evaluated with the opportunisitic pathogen, Pseudomonas aeruginosa. Differences in the propolis tinctures samples were identified by physiochemical profiles and absorption spectra. Propolis tinctures at 0.0005% v/v that do not affect bacteria biosensor growth or the reporter system monitored were exposed to biosensors with and without the addition an AHL. No AHL signal mimics were found to be present in the propolis tinctures. However, when propolis and an inducer AHL signal were together exposed to five E.coli and a Chromobacterium violaceum biosensor, propolis disrupted the QS bacterial signaling system in liquid- and agar-based bioassays and in C18 reverse-phase thin-layer plate assays. Swarming motility in the opportunistic pathogen, P. aeruginosa PAO1 and its AHL-dependent LasR- and RhlR-based QS behaviors were also inhibited by propolis. Together, we present evidence that propolis contain compounds that suppress QS responses. In this regard, anti-pathogenic compounds from bee harvested propolis could be identified and isolated and thus will be valuable for the further development of therapeutics to disrupt QS signaling systems which regulate the virulome in many pathogenic bacteria. this study reinforces the advantages of cooking with honey instead sugar -- protect your food and your body! Honey has been used as a topical antibiotic since the Egyptians wrote papyrus prescriptions. Now, a Cornell food scientist has identified an antimicrobial compound in a honey that makes it a promising candidate as a natural preservative to prevent food-borne illness and food spoilage. Randy Worobo, associate professor of food microbiology at the New York State Agricultural Experiment Station in Geneva, and his lab members tested more than 2,000 strains of bacteria from eight types of honey from the United States and New Zealand. One of them stood out. "In sunflower honey from South Dakota, we identified a strain of Bacillus thuringiensis the biological control known to organic gardeners as 'Bt' — which was effective against common food-borne pathogens including Listeria monocytogenes, the bacteria behind the recent deadly cantaloupe outbreak," said Worobo. "This Bt strain was intriguing, because it had both strong antibacterial and strong antifungal activity." In analyzing the compounds produced by the bacteria, they found one with strong antibacterial activity that they designated as thurincin H. They recognized it as a bacteriocin, a common class of antimicrobials that bacteria produce to compete against other microbes. But compared with the some 40 known bacteriocins, it is unique: It is coded in the bacterial DNA as a unit containing three identical copies of the same bacteriocin gene. Their findings were reported in September in Angewandte Chemie International Edition…. ..."Bacteriocins are promising natural food preservatives for the food, livestock and agricultural industries," said Worobo. "Because they come from food-grade microorganisms, they are generally regarded as safe." 1994-2011. Picture Window theme. Powered by Blogger.